I always try to show a positive attitude here. I’m blessed with health, family and a good job. So rather than write a long paragraph justifying my right to feel like crap once in a while I’m just going to say it…I can’t run and it hurts physically and emotionally. I hate it! I mad, sad, frustrated and annoyed. I ran my longest long run last week, 22 miles. It went quite well or so I thought. Two days later I felt a twinge of an ache above my ankle on the back side of my leg. I stopped running. I haven’t run since Sunday. The area is sore and the soreness increases to pain whenever I increase my activity. I couldn’t pin point the location so I wasn’t sure it was my Achilles again. I was feeling great today so I decided to take advantage of my afternoon alone and go for a slow stroll at the college. When I say slow I’m talking I walked at a very leisurely pace. I read blogs on my phone and drank tea. Little by little the pain behind my leg just above my ankle increased. Upon returning to my car I had to walk uphill and that’s when I knew it was my Achilles. All signs point to Achilles tendonitis. I will try to write a more detailed post later as I learn more, but essentially running is a really horrible idea right now. I’m writing this to reach out to my blog friends. I need some words of wisdom and support. I am mad as hell. I have worked so hard training for this marathon and I’ll be damned if I can’t run it. Having dealt with this back in late spring I’m certain with proper care that I will be able to run the marathon which is a month away on 11/18. I know there are much bigger problems in the world. I don’t mean to be unnecessarily dramatic. I just never imagined not being able to run would break my heart this way. I was passed by no less than 20 runners on my walk and my heart surged every time they ran by. I wasn’t jealous. I felt sad. These injuries have made me realize how much running has become an integral part of my life both for my physical health and my mental well being. I need to stay active without risking further injury. I need to watch my diet very carefully because stress = emotional eating for me which obviously leads to weight gain. If I’m going to run this marathon without the last couple weeks of training then I need to be wise. Please offer up any advice from your own experience or that of your family or friends. I am so sorry to say that I don’t have any advice. I know you need to rest up. Can you get in a pool and do laps to stay active? I know you have the fitness to run the marathon now, so long as your injury allows you to. I’ll be thinking of you. Thanks Emily. I thought about finding a pool. I love to swim anyway. I have been using the bike at the gym as well as the elliptical. So far so good. 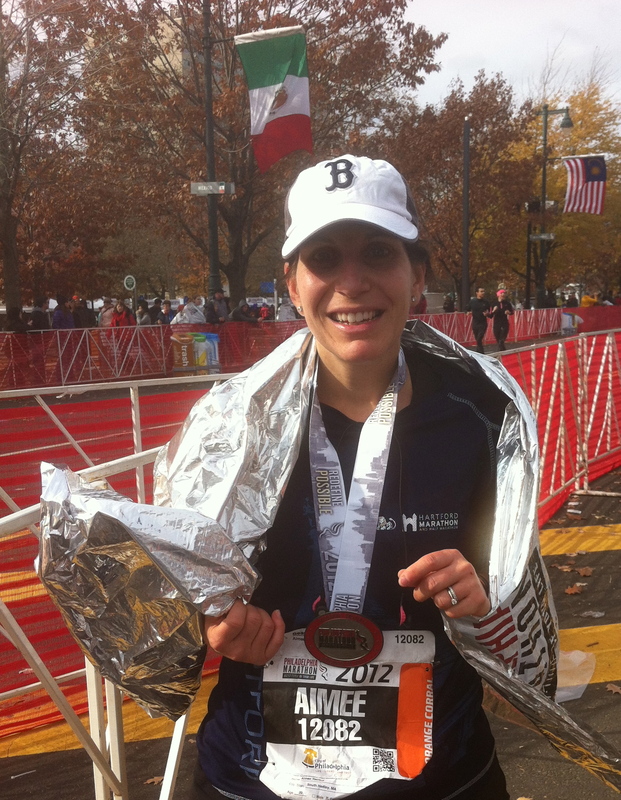 Sending big hugs your way Aimee – not being a runner, I have no advice other than to rest the next couple days and see how it goes – hugs! I don’t have any advice for you, but I’m definitely thinking about you. Hugs! I had something similar – my twin Biz sent me over here. I finished 2 marathons. I went to the foot doctor, $30.00 co-pay, she gave me inserts for my gym shoes, pain gone! I had something more on the bottom of my heel, but it hurt to just walk a few feet, let alone run. It worked for me, so mabye try that out? And I was 1 month out from my 1st. I used those inserts the rest of the time and always felt great. I did a half marathon in April and also, no pain. Good luck to you! Hi Jen thank you for stopping by. Biz is the best. What kind of inserts are they exactly? I’m so happy to hear your pain resolved. Oh no, this stinks! As hard as it is rest really is the best medicine. Rest it, ice it a few times a day. Do a lot of gentle stretching, when I get this I find it often starts way up in the back and works its way down. I am so bad about stretching, but when I stick to it I feel so much better. Takes time, you sound like you are ready for the marathon even if you have to take time off before hand. Hope the pain subsides and you are back out there soon. Thanks Jacky. I am feeling confident that I will be fine to run the marathon. Thanks for reminding me about compression stockings. I am adopting a stretching routine. It’s important and ridiculous that I can run for 4+ hours but then argue that I don’t have enough time to stretch. You must be in taper mode. I hope your training is going well. I really wish I could be there to cheer you on. I’m so excited for you. Oh, and my compression socks really helped when I was having similar issues. Aimee…I’m so sorry to hear that you are having this kind of issue again. I have no advice to give, but to just trust your body…rest and let it tell you when you are ready to run again. Maybe start some other activity to pass the time while you are not running…knitting, crocheting…these activities will keep your hands busy and thus hopefully help you not to turn to food when feeling so emotionally down. I’m thinking only good thoughts that you will be able to run this marathon after all of your hard training! Thank you so much Kaye. I really like the idea of finding something to do to keep my hands busy. Perfect advice for me right now. I’m so sorry about the rough time you are having …. I have no advice for you, but thinking about you! I’ve been having a rough time in other areas of my life , and how is it that when you are struggling you see other people doing just what you would like to be doing!! Thanks Jane. I keep reminding myself that this too shall pass. I’m trying to learn something from this and avoid feeling sorry for myself. Of course the weather has been perfect running weather and runners were out and about all weekend. Hi Tina, thanks for your comment. I am working on a post with more details about how I’m dealing with the Achilles tendonitis. It’s feeling better, but I haven’t started running again. Well, you know my boot and I feel your pain! I’m so sorry and really have no advice other than get to a podiatrist or ortho ASAP. Helen I have been thinking of you through this. I think the mental struggle is worse than the physical most of the time. I did actually go to the podiatrist for a reoccurring ingrown toenail issue and she concurred that it sounded like the Achilles. She reinforced a good stretching routine and seemed to think I was going about things the right way. She encouraged me to avoid running even longer than I had planned. I needed to hear it.